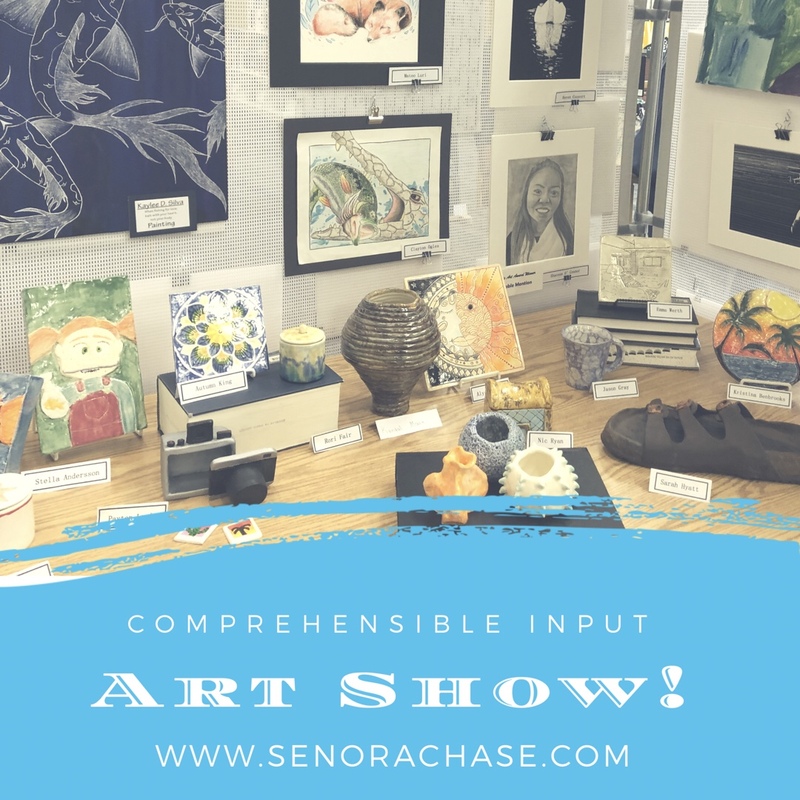 Every year our Art Department puts on an outstanding Student Art Show, and every year our Language Department uses it as an opportunity to get out of our classrooms, encourage our little darlings to speak Spanish and appreciate their classmates’ talents. You guys, it is so fun to talk about their art in slow, comprehensible language! If your school does an Art Show, you’ve got to use it in class! Since our department gets “free reign” of the Art Show the first 20 minutes of each class period, we hustle down to the Media Center as soon as class starts. On the way out the door, students pick up this sheet to help them talk about the art. And since there are only Spanish and French students there, it’s easy(ish) for us language teachers to enforce the “No inglés” rule…. It’s a special time to chat it up with kiddos and it feels different because we are out of our normal element…I love standing next to a kiddo and asking ¿Cuál fotografía te gusta más? or ¿Cuál es tu favorito? or ¿Tienes arte en el show? We stay at the show only 15-20 minutes before we go back to the classroom where the input begins! On years I’m really on it, I like to take pictures of my students’ art and project it so we can talk about it, Picture Talk Style. On years that I’m not (like this year!!) I just wing it, using the 3 questions on the front of the handout to guide our conversation. I use these questions with every level, from my level 1 to my level 4s. Just do what you do: go slow, make it comprehensible, write new words and their translations on the board and talk with them. Can you use the past subjunctive and conditional tenses in Spanish 1?! Yeah, sure, you betcha! The question: Which work of art would you buy if you could is fun, because I follow up with the question How much would you pay for it? And I totally encourage a bidding war between students which is hilarious. Señora Chase: ¿Cuánto pagarías por la obra? Señora Chase: Clase, Evan pagaría $5. ¿Quién pagaría $20? Señora Chase: Ohhh! A Joe le gusta la obra muchísimo El pagaría $1000. ¿Quién pagaría dos mil? Depending on the day and level, I might ask them to write out their answers after we’ve had lots of discussion. Sometimes I do, sometimes I don’t….just depends if I need a break to catch my breath. I don’t care very much about what they’ve written down, the real value is the comprehensible input during the class discussion. If your school does an Art Show, ask them, beg them, plead with them…to let your department “reserve” the Art Show during every class. Do it! It’s so fun! And it’s the kind of thing we need when summer is right around of the corner and the little darlings are going bonkers!! How many days left…!? I absolutely LOVE, LOVE, LOVE this idea!!! I’m going to talk about it with my art colleagues TODAY!! !